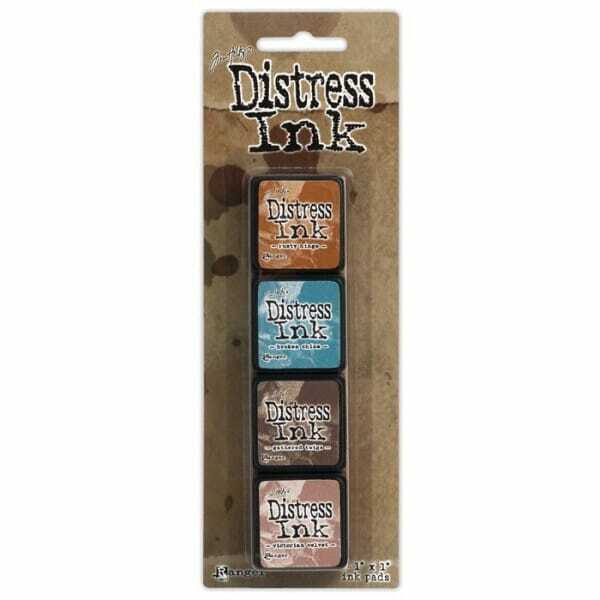 Tim Holtz Distress Mini Ink Pads Kit 6 - Sold in one strip of 4 pads. Kit 6 (Includes Rusty Hinge, Broken China, Gathered Twigs & Victorian Velvet). 24 Distress palette colors, 1 x 1 stackable pad, Raised felt surface, Available in 6 kits featuring, 4 pads each, Coordinates with the Distress palette of products. Customer evaluation for "Ranger Ink - Tim Holtz Distress Mini Ink Pads Kit 6 - Sold in one strip of 4 pads"